February 2017 – But Is It Any Good? OTHER SONGS YOU MAY KNOW: Maybe? College radio would have eaten this up. WHAT’S IT ALL ABOUT: The final independent release for the band blasts away quite a bit of the distortion and leaves the listener impressed with their knack for melody. SOME WORDS, PHRASES AND CLAUSES ABOUT THIS RECORD: Before leaving for a major label, Surfer Blood gave the world Tarot Classics, a very tuneful four song EP with two (remixes) that you can take or leave. The songs definitely show a knack for hooks and melody, and John Paul Pitts seems to have left a lot of the distortion behind even though the love for the Pixies that show through in the tunes. The two remixes waste time – a four track EP would have been nice. NOTES & MINUTIAE: They moved from Kanine to Warner Brothers after this EP. GRADE: B: Four nice tracks, but the two remixes drag it way down. OTHER SONGS YOU MAY KNOW: Prolly not. WHAT’S IT ALL ABOUT: An EP that moves the band from total noisy clatter to a more polished outfit. SOME WORDS, PHRASES AND CLAUSES ABOUT THIS RECORD: The six songs on this EP are a bit of a transition for the band. Brace Paine can still raise a ruckus with his guitar, and Kathy Mendonca’s drumming isn’t exactly subtle, but the songs are coming through nice and clear now. Beth Ditto’s vocals demand to be heard above the grind – they’re compelling and powerful. The only flaw is the final track – at over 10 minutes it starts slowly and outlasts its welcome. But the first five are good enough for any fan of garage rock fun. NOTES & MINUTIAE: Brace Paine was still known as Nathan Howdeshell at this time. GRADE: B: Good tracks, but the last cut brings it down. OTHER SONGS YOU MAY KNOW: Wood Goblins. WHAT’S IT ALL ABOUT: An EP of mass destruction of your ears – heavy duty grunge. SOME WORDS, PHRASES AND CLAUSES ABOUT THIS RECORD: Hot on the heels of God’s Balls, Tad Doyle and crew cranked out an EP which built upon and expanded the hard, grungy sound of the group. I kid you not, this is heavy duty, resembling Tad’s stout frame. The first side of the EP is absolutely vital for any student of this era (“Axe to Grind”, “High on the Hog”, and “Wood Goblins” – one of the best videos of the genre). The other side seems somewhat redundant, which was the problem with the band at the time. Heavy as they were, there weren’t any changeups here. When this was released on CD later that year, Sub Pop added the single “Loser” – the rallying cry for Tad and the entire movement. Loser’s got nothing to lose. NOTES & MINUTIAE: If you try to Google “Axe to Grind” to find the lyrics – you get Bastille and Sawyer Brown. Not the same song, not even in the same area code. IS THERE A DELUXE VERSION: Well, when this came out on CD, they added seven of the 10 tracks from God’s Balls (why not make two separate CDs?) and didn’t add the B-side of “Loser”. With the new releases out now, they add that B-side, a great compilation single “Habit & Necessity” and a Black Flag cover. GRADE: B+: Four essential tracks. Not a bad percentage. OTHER SONGS YOU MAY KNOW: No, this thing’s been buried. WHAT’S IT ALL ABOUT: A totally unmemorable album only in print because of who the band became. SOME WORDS, PHRASES AND CLAUSES ABOUT THIS RECORD: Sure, there are some nice moments on this record. But, they all sound like rough drafts for the songs that made the Doobie Brothers famous. “Nobody” has the acoustic guitar drive, harmonies, and guitar solo that would be the Doobie’s formula (pre-Michael McDonald). It’s the only one that really appears on any compilation that’s not a box set. Even with these prototypes, the songs didn’t transcend the absolute meh of the album. It tries, and yes, it’s tasteful and polished and harmonious, but it doesn’t trip any triggers. There was enough here to get them another album, which they made the most of. But unless you’re a diehard, skip this one. NOTES & MINUTIAE: They cover a Randy Newman song (“The Beehive State”), which is…interesting. GRADE: C: It’s just…so meh. EXILED. WHAT’S IT ALL ABOUT: Debut album shows a little songwriting prowess, but sounds generic compared to his later work. SOME WORDS, PHRASES AND CLAUSES ABOUT THIS RECORD: The opening cut of Eric Church’s debut album falls definitely in the usual ‘southern country rock’ school of modern country, but with a lyrical twist that’s refreshing. Church’s writing helps break past the usual sound that’s plagued country music for a while. A more traditional song like the title cut serves Church better. There’s some modern flair to it (the more distorted guitars and drumming) but at this stage he’s better in the traditional milieu. He got a feather in his hat when Merle Haggard sang with him on “Pledge Allegiance to the Hag”. Of course, who wouldn’t pledge allegiance to Merle? NOTES & MINUTIAE: He was kicked off the Rascal Flatts tour for playing too long. Poor snowflakes. GRADE: B: Generic sounding at times, but the songwriting saves a lot of it. 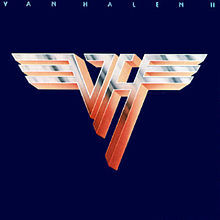 WHAT’S IT ALL ABOUT: The second album blues strikes Van Halen. While some songs are top notch, the record reveals shortcomings that would plague the band going forward. SOME WORDS, PHRASES AND CLAUSES ABOUT THIS RECORD: It was going to be hard to follow up their debut album, but when “Dance the Night Away” came out as a single, there was hope the second album would reach the heights of the first. That was a perfect pop metal tune, and while other songs were almost as fantastic, there wasn’t enough good tunes to outweigh the issues. Mainly, there wasn’t enough songs to make it worthwhile, and a couple three tracks were blatant filler. Van Halen would never be prolific in their early days, releasing short albums and / or plenty of covers. While there are some good to great songs here, it’s not an essential release. NOTES & MINUTIAE: They thanked the Sheraton in Madison after they trashed the seventh floor during a tour stop. GRADE: B-: Too short, too much reliant on filler. A shame since there’s some good stuff here. WHAT’S IT ALL ABOUT: The title cut is a classic, and the rest of the album is quite complementary, making this a great 60’s country album. SOME WORDS, PHRASES AND CLAUSES ABOUT THIS RECORD: Merle Haggard was one of the few country artists not to succumb to the ‘hit plus filler’ country album that many lesser artists churned out in the 60’s. The title cut is a legendary country song from the husband and wife team of Liz and Casey Anderson, but Hag writes most of the other songs on the record and they’re good quality as well. “Life in Prison” is his self-penned classic here – a tale of woe covered by so many others, including the Byrds. The band was full of LA hotshots, and included great backing vocals by Bonnie Owens. All in all, a great country album – and a rare one to cross over somewhat to the pop charts. NOTES & MINUTIAE: When the songwriters played “I’m a Lonesome Fugitive” to Haggard, they were unaware that he actually did time at San Quentin. GRADE: A-: Another great country album from Haggard, and the deep cuts are worthy as well. WHAT’S IT ALL ABOUT: A somewhat mixed album from Jackson – the last from his classic band for many years. Sequencing is a big problem here. SOME WORDS, PHRASES AND CLAUSES ABOUT THIS RECORD: There’s some great songs on this album. “One to One” is a classic Joe Jackson piano ballad, “Biology” hearkens back to the origins of the band with some interesting production, and Jackson’s band handles reggae beats well with “In Every Dream Home (A Nightmare)”. The main issue here is sequencing. There’s some weaker songs here, and they stand out thanks to their placement. Also, opening with “Beat Crazy” instead of “One to One” (which to me sounded like a classic album opener for Jackson) is off-putting to my ears. “Mad at You” is great, but then goes on for about 30-45 seconds too long. The album shows the bands versatility, and Jackson’s knack for songwriting in many genres and styles, but it seems more of a tossed together collection than a cohesive unit – even with the songs blending into each other. NOTES & MINUTIAE: It was credited to the Joe Jackson Band, which would break up after the European tour for the album. GRADE: B-: If it was sequenced properly, it would probably be a B or B+. WHAT’S IT ALL ABOUT: Second studio solo studio side from Mayfield moves his funk vision forward. SOME WORDS, PHRASES AND CLAUSES ABOUT THIS RECORD: Curtis Mayfield’s move from the Impressions vocal magic toward being a funk auteur is complete with this great 1971 album. A hot ensemble featuring some great bass work by Joseph “Lucky” Scott creates outta site grooves, while Mayfield’s voice floats above it all. Even though Mayfield still has his social conscious side, he’s also moved into the carnal with the salacious “Get Down”. His vocals adapt from that randy funk to “Keep On Keeping On”, a great ballad about perseverance. Mayfield wouldn’t strike retail gold just yet, but while this album isn’t as well known as others by him, it’s definitely funky enough to have in your collection. NOTES & MINUTIAE: The female vocalists aren’t credited, and one of them definitely did some ‘work’ on “Get Down”. IS THERE A DELUXE VERSION: Yes, single edits and a demo. GRADE: A: Solid songs, arrangements, and vocals, and then there’s the funk. Always with the funk. WHAT’S IT ALL ABOUT: The confusing US / UK Stones’ discography reaches its peak, with the same title for two pretty much different albums and a US collection that collects leftovers and singles, with some live cuts from a UK EP. SOME WORDS, PHRASES AND CLAUSES ABOUT THIS RECORD: Whew. This was a productive time for the Rolling Stones, and both Decca and London we’re trying their best to keep up. In the UK, singles came out (not on an album), and an album and live EP were delivered. The same singles came out in the US, with two albums cobbled together from the various sessions. These recordings mark the end of the Stones as interpreters, but they go out on a strong note with great covers of “Mercy Mercy”, “Cry to Me”, and “She Said Yeah” among others. The Stones’ originals come to the fore, with “I’m Free”, “Under Assistant…”, “Heart of Stone”, “As Tears Go By”, and the two smash singles “Satisfaction’ and “Get Off My Cloud”. They were really rivaling the Beatles now in success and songwriting. The one ‘interesting’ piece of this puzzle is the live EP Got Live if You Want It, since it’s mostly a bunch of screaming with the Stones somewhere in the clatter. They kind of reduce the value of the US versions as they’re out of sync, and the US versions don’t have a lot of continuity (since they go back to 1963 at some points to make up the numbers). Cobble together your own ‘super’ Out of Our Heads with December’s Children (and Everybody’s) with these sessions. Most everything is worthy of keeping in your collection. NOTES & MINUTIAE: The EP Got Live if You Want It is not the same as the US LP from 1966 (which the Stones didn’t like at all and was mostly a contractual obligation). IS THERE A DELUXE VERSION: No, it’s all together there. GRADE: A-: The whole lot gets an A-, some outstanding tracks and a few flaws in continuity.